I began my journey at Pursuant Health (formerly SoloHealth) as a visual designer with a strong interest in user-centered design. With the guidance and support of my mentor, Ryan Sloan, I began to advocate for a significantly stronger focus on the importance of the user experience. Due to the lean business environment, it was critical that I supported our product and marketing efforts in addition to remediating the existing user experience. After a few years of supporting both efforts, I was able to transition the product and marketing initiatives to individual self-sustaining departments. In 2017, I shifted my attention to personal and professional development and growth. I carefully researched opportunities through which I could advance within the HCI field with a more meaningful and expansive skillset. After seeking advice and guidance from HCI leaders and various department heads at Georgia Tech, I established a goal: Apply for admittance into the Georgia Tech Masters in Human Computer Interaction upcoming Fall 2018 class – and I got in! 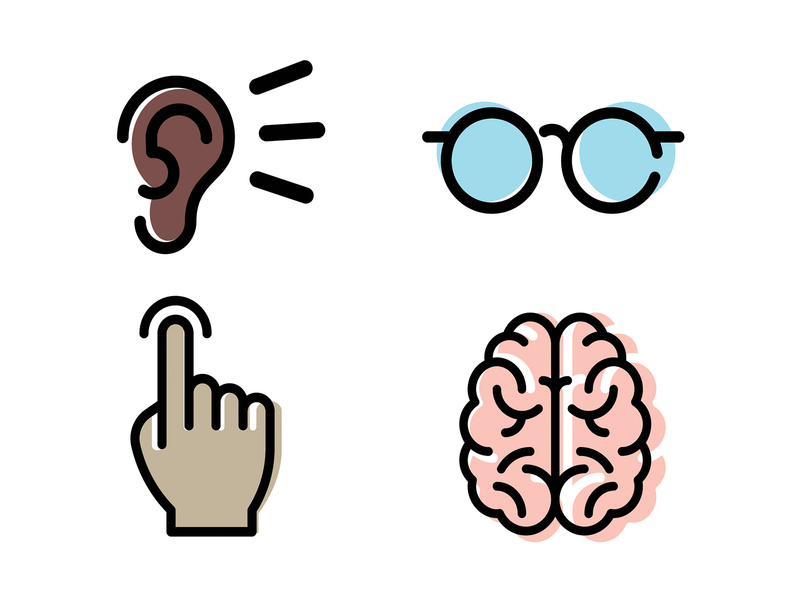 Currently, we are focusing on several user-centered design initiatives that are slated for release in 2019. In addition, I am working on an exciting project in collaboration with Georgia WIC at Georgia Tech! 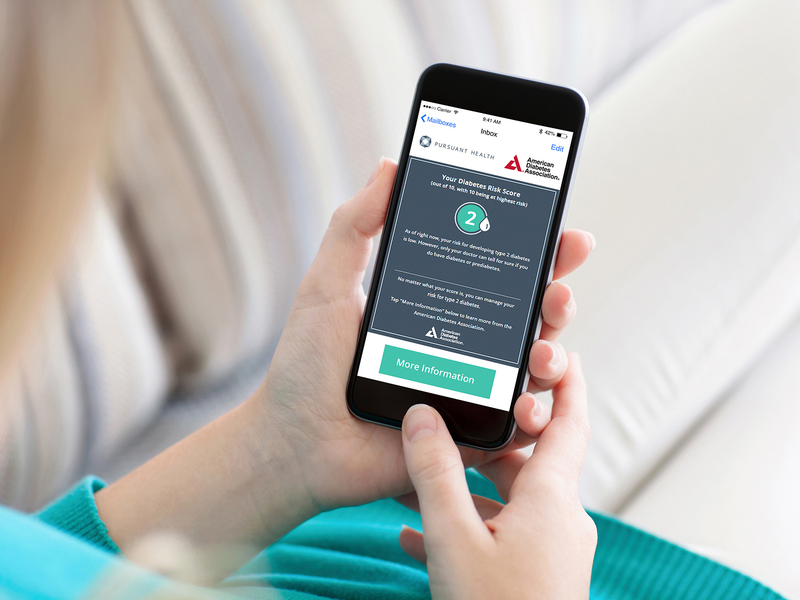 The Health Age assessment, developed with the world-renowned health experts of Cleveland Clinic Wellness, starts by measuring weight and blood pressure followed by behavioral and lifestyle questions. The assessment takes the average user 4-5 minutes and ends by using an algorithm to analyze results and reveal Health Age compared to actual age. 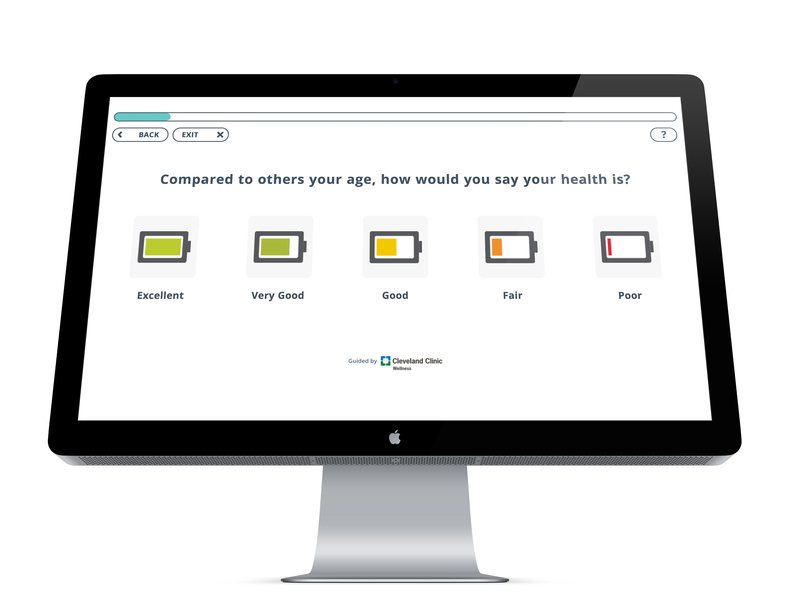 Upon completing the assessment, users are shown the top three things to improve Health Age. The results screen provides users with personalized recommendations. The Health Age is available on both web and kiosk platforms. New members of Anthem BlueCross and BlueShield’s Hoosier Healthwise, Hoosier Care Connect and Healthy Indiana plans in Indiana take health risk screening at kiosks and earn reward. 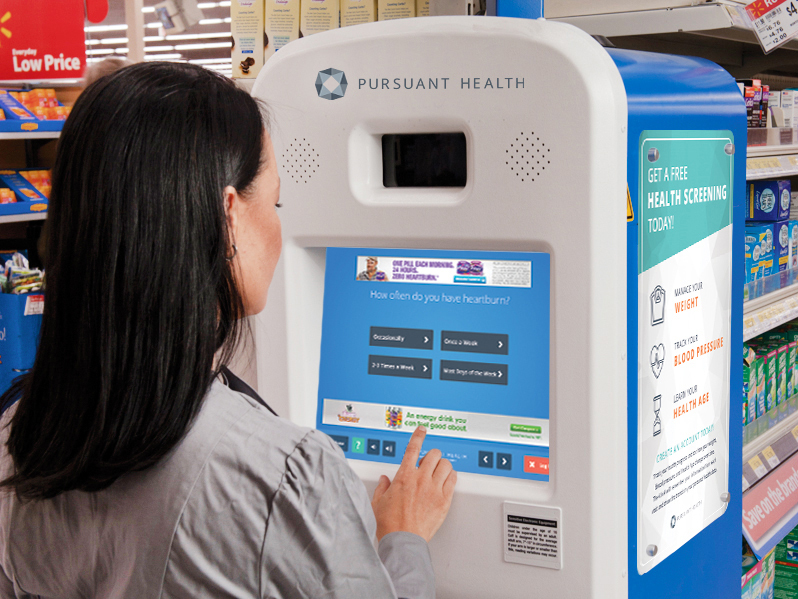 Eligible health plan members scan a reward card with a unique secure barcode at Pursuant Health kiosks in Walmart pharmacies to launch health plan specific assessments and surveys including health risk assessments, diabetic retinopathy screening programs, and flu shot programs. Once a program is completed, a monetary reward is loaded to the card to spend at the very same visit. Additional products and programs, including digital incentives, are in the planning and development stage. Through this Certification, the proprietary health risk assessment, known as the Health Age HRA, is recognized as an NCQA-Certified Health Appraisal. 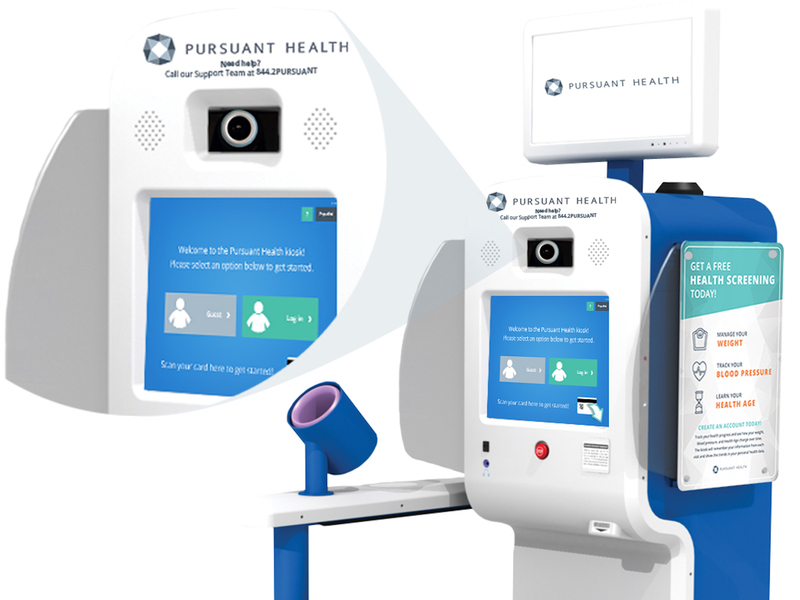 This unique, image-based Health Age HRA was co-developed with Cleveland Clinic Wellness and is designed to be taken in 5-6 minutes, either online or at any of Pursuant Health’s national network of health kiosks. During the Health Age HRA, the kiosk measures the user’s weight, blood pressure, pulse and calculates BMI, providing the first NCQA-Certified HRA that conveniently combines a health questionnaire with non-invasive biometric screenings. The result is a score in the form of an easily-understood Health Age coupled with simple, personalized advice and interventional program offerings from Cleveland Clinic Wellness. The Diabetes Risk Test asks simple questions about weight, age, family history and other potential risk factors for diabetes. The user’s results are reported as a numerical score indicating low- or high-risk for developing type 2 diabetes. Those identified as high-risk are encouraged to speak with their doctor to learn more about ways to help reduce their risk or delay the onset of diabetes. The latest diabetes statistics indicate that more than 8 million American adults have diabetes and don’t know it. Another 86 million American adults—more than one in three—have pre-diabetes, which means that their blood glucose (sugar) is higher than normal, yet not high enough to meet the criteria for diabetes. These statistics demonstrate a critical need for Americans to be informed about their health status and risks for type 2 diabetes. According to the American Diabetes Association, diabetes is the leading cause of blindness. “Over time, high blood sugar levels from diabetes lead to damage of the retina, the layer on the back of the eye that captures images and sends them to the brain. Eye damage can be occurring without any initial symptoms. That is why it is so important for people with diabetes to get regular eye examinations and catch problems before serious retinal changes occur.” Because diabetic retinopathy impacts up to 85% of individuals with diabetes, the ability to increase the total number of screenings can significantly reduce instances of preventable blindness and overall healthcare costs simultaneously. The ability to utilize a self-service health kiosk to capture retinal images, coordinate with eye specialists for processing and report results back to primary care physicians in the most convenient way possible has the power to transform how healthcare is delivered.